This blogging lark’s great innit? A few posts ago I wrote about the lack of baby shoes in charity shops. 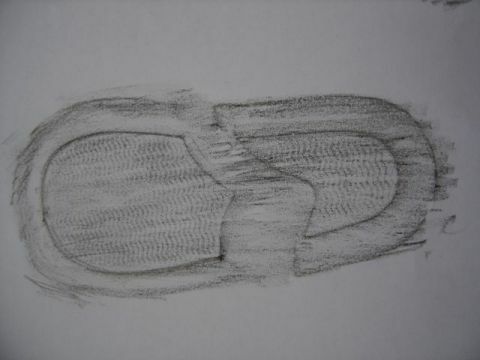 My blogging friend Kate Murdoch has come to the rescue, basically doing my research for me and sending me photographs of shoe sole rubbings, complete with photos of the shoes, set of measurements and an offer to post them should I require them. Brilliant, Kate, thanks! And if I can return the favour at any time, let me know. I suppose you could call it collaborative research if you were being poncy? I call it good, supportive, friendly practice. Love it. Today I made a 7ft cardboard giraffe with y4, and bugs as big as your face with y1. 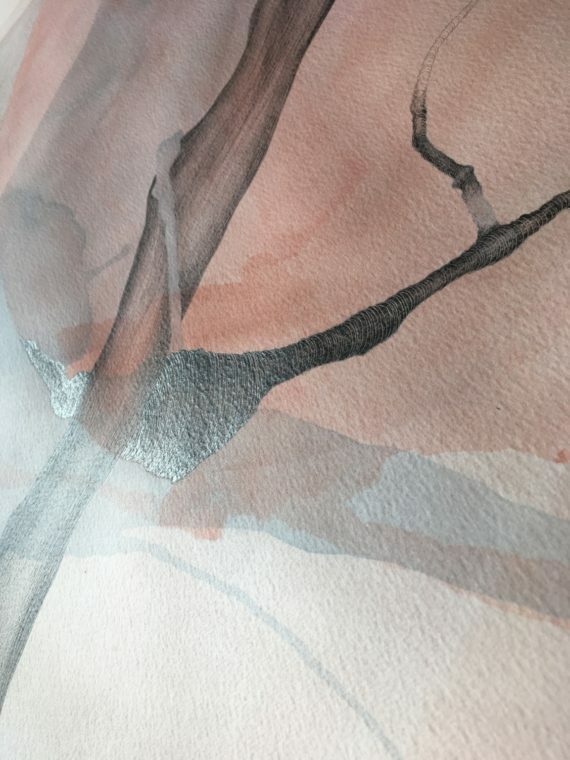 Tomorrow I’m painting with sticks with reception class, and printing with y2… possibly on wallpaper, or I’ve got a big roll of thin pink paper that’s not much good for anything else. I might get them to do wallpaper printing then find a wall on Friday to hang it on…wonder how that’ll go down? Has anyone else been thrown by the fact that half term was a week late? One of the only bits of my school job that I hate is the fact I have to get involved in data analysis of results, target setting and the submission of key stage results to the local authority. In previous years the pattern has been… order materials week, half term week, materials arrive week, planning timetable week, arts week, data week. It runs very sweetly until they switch half term and suddenly arts week is also data week. Not a problem if it’s 2 different people, but not if it’s both me! People have asked me if I’m tired/stressed etc because it’s arts week. No. I’m not. Arts week is brilliant. What stresses me is the half hour at the end of the day when I had to send off the Foundation Stage Profile. I feel as if my blog has been predominantly schooly lately? Has it? Or is it just me? Anyway… once I’ve finished arts week, and the data has gone, (until this time next year) I can concentrate on transferring these beautiful shoe prints onto my dress, record some songs, and get on with my own life. Had a phone call from the newspaper ad lady… she apologised for the appearance of ad, as she had been away for a few days and hadn’t realised what they’d done. All is now well, and she’s sending me new proof within 24hrs. And she’s bringing all her friends to LOAF too. Didn’t need to use the script! phew! Children should be encouraged to be bravely, un-self-consciously, actively creative in as many different ways and as often as possible… I love arts week. You see many of the children at their best, when sometimes, stuck behind their tables, you see them at their worst. It’s true you know. it’s only Tuesday and I swear that line of usual suspects outside the headteacher’s office has been less. Those children instead, I’ve spotted them dancing, not just in the hall with the dance tutor, but on their way to lunch, and in the classroom, stood up at their tables, cutting and sticking. I’ve heard someone else singing, constantly, and uninterrupted, while the class make masks. Someone else doodles… on the interactive whiteboard, then another child shows them how to duplicate what they’ve done and make a pattern. I watched someone totally absorbed in the ribbon like trickle of pva glue onto a piece of corrugated cardboard. I watched a child who usually is in 4 places at once, stare intently into a mirror and draw the reflection, for about 45 minutes. While I’m talking to one child, the boy next to him is beating out sycopated rhythms on his chair with a ruler. I manage to stop myself from being irritated long enough to realise how clever he is being. It is clear that these particular children can concentrate. We’re just asking them to concentrate on the wrong things at the wrong time, in the wrong way. And as soon as they get interested in something, a bell rings and we ask them to move on to something else. Recently I have been questioning the whole social control/bell related educational remit. Of course we need to teach children the rules of our society, that’s a no-brainer. But do we need to do all of it in the educational sphere? Marion did say I must have lists going on in my head… well… almost… I’m really BAD at keeping things in my head, so any list I have going on is definitely on paper. Possibly in different coloured pens. My diary is jam packed, and I have to make a point of looking at it over breakfast every day, otherwise I totally forget what I’m supposed to be doing. This week is arts week in school, so I’m in every day. I have a pink exercise book I’ve pinched out of the school stationery cupboard and I have a double page spread for each day… this is in addition to the timetable up on the staff room wall. Each page has a list of what I’m doing, who with, where, and what materials I need. The back of the art room has a box containing all the materials required for each activity throughout the week. Then I have a section on which visiting artist is coming in, what they are doing, who with, what materials, where, and they have a box too. Then I have a list of parent helpers who are given a cup of tea, instructed as to where they are and what they are to do. There is NO WAY this could go on in just my head! I love Arts Week. I go in whistling a happy tune and get yelled at by those who don’t. Once I am organised, it is bliss. I am happy and exhausted at the end of each day. Today, with year 6 we made a life size man to sit at one of the benches in the playground. He is made from papier mache and chicken wire. His name is Bob. He is The Daily Male. They have decided not to paint him, but sit next to him and read him. Friendly! Tomorrow I am making Clingfilmy window thingies with y3, they will get dangled from the trees. Then in the afternoon writing songs with y5. Brill. Feeling in limbo… like I’m on a stake-out. Waiting, ever ready, but nothing’s happening. The adrenalin is swooshing about, fight or flight preparedness paramount. I have all this stuff waiting to be done, but just can’t get at it yet. Of course, I have Arts Week in school next week, I’m all prepared for that, but can’t start till Monday. I have a couple of work deadlines looming, but can’t do anything about those till other people have done their bit. I have my own art work I want to do, but I daren’t start it, because once I do, that’ll be it for 6 weeks. The similes and metaphors abound, I’m climbing this big hill, to the end of term, then SWOOSH! Off I go! So I pace about the house. 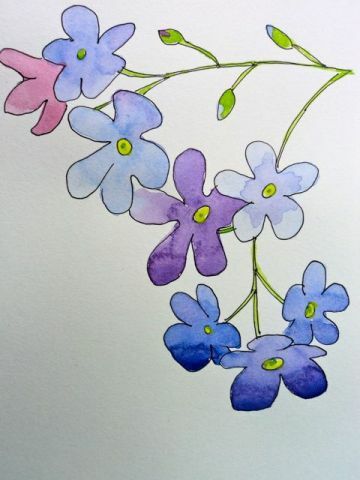 Then I go to Rachel’s garden and paint flowers for goodness sake! Fun, but crikey, I have got better things I could be doing! I could even do some decent cooking or some housework, but can’t settle. I’ll be better on Monday, because my feet won’t touch the ground, and I’ll get rid of some of this…. Whatever it is. I’ll be told off by my husband in a minute for “jiggling my bloody legs in front of the football”. It’s happened before. Did you know that charity shops aren’t allowed to sell baby shoes? Why not? Stupid! I went to 3 and found nothing before they actually told me. So I’ve now got to hijack small children and upend them to look at the tread on the bottoms of their shoes. Then take rubbings. I was at less risk of arrest if I’d been able to buy a pair from Oxfam for goodness sake! Anyway, I’ve managed to find a pair of bootee type things, but there’s not much in the way of tread pattern. I’ve done most of the jobs I had on the list in the last post, except the tricky one. I can’t face calling back the newspaper ad woman, and I cant think what to say to her… Dread. You know when you just know something is going to take ages to explain and you know they just don’t really get it? Where do I start? Off to Birmingham tomorrow to do a day of endurance French knitting in the Mailbox. Pop in if you’re around!